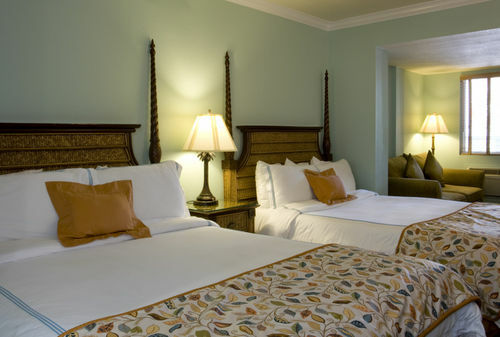 This 22 room elegant inn is a tropical oasis in the heart of old town, just one half block off Duval Street and an easy walk to restaurants, shops, and other attractions. Exquisitely appointed guest rooms are fully equipped with 27 inch color TV with movie and sports channels, radio, air conditioning / heat, refrigerators, microwave ovens, digital safes, ceiling fans, coffee makers, hair dryers, irons, robes and two-line phones with voice-mail and computer data ports. All rooms are non-smoking. The Almond Tree has all the amenities of a B and B with complimentary continental breakfast and happy hour with free beer, wine and soft drinks. Cool off in our sparkling pool or relax in our bubbly spa. Off-Street Parking: One parking space is available for each guest room at only $5.00 per day. All guests must be 25 years or older unless accompanied by a parent.